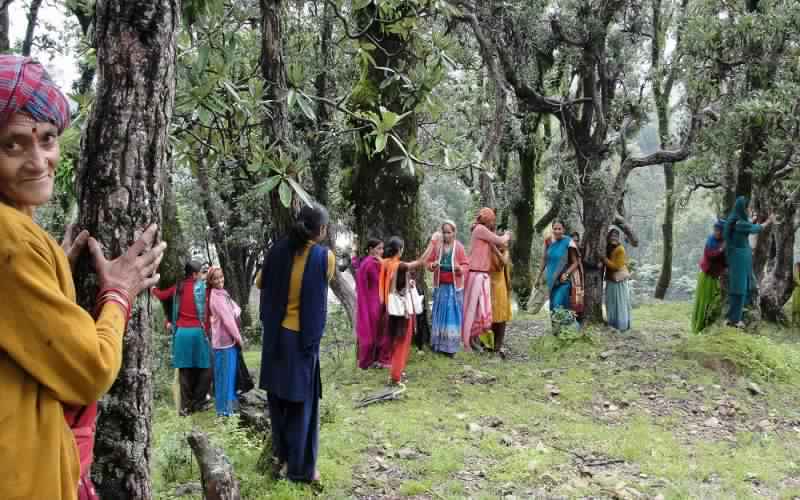 Chipko Movement, also known as Chipko Andolan was one of those revolutionary movements that made the governments to drop their weapons and surrender to cut down the trees. Most of the save tree posters designed in our country are inspired by this very famous movement. This so renowned Chipko movement has been implemented more than once or twice at a different region of India and each time we got different Chipko Movement leaders. As per some data, the very first time Chipko movement started by some Bishnoi in Rajasthan in the 18th century. That time, the Chipko movement led by Amrita Devi. As a result, the king of Jodhpur banned cutting of trees in all the Bishnoi villages. That movement sacrificed a large number of Bishnois. This movement was launched to save khejri trees which are worshiped in so many regions of Rajasthan. This movement took some lives but it really left a long-lasting impact over the King of Jodhpur and other empires of the nations. The word ‘Chipko’ means ‘to embrace’. So in that movement, people hugged the trees and didn’t allow the government workers to cut the tree without taking their lives. Every time, it has been a non-violent movement and no violence has even been shown by the volunteers of the movements. Sometimes, few persons went on a hunger strike which was again a non-violent act of protest. Among all these Chipko movements that the world has encountered, the only answer we get for the question “who started Chipko Movement?” is Sunderlal Bahugan. He was the man who led the mass of the villages of Uttrakhand in the year 1973. He is considered to be an eco-activist who spent his in spreading awareness among the people of the country regarding the importance of the ecosystem and educating the villagers about saving the trees and the very little part of nature alive with us. Saving the eco-system from the increasing industrialization without causing any violence under the influence of Satyagraha was the main objective of Chipko Movement. During that time, both male and females played a major role in the success and the spreading of the chipko Movement. Gaura Devi, Suraksha Devi, Bachni Devi, and Chandi Prasad Bhatt are some well-known female names when we discuss the Chipko movement. Their contribution to the movement was important and rigid. Sunderlal Bahugan is well known the slogan he gave during the Chipko Movement. This famous slogan reads like “Ecosystem Is The Permanent Economy”. Indira Gandhi was the Prime Minister of India when this movement took place and she had no other options than to take back the orders of cutting the trees. Not just that, the movement had a great impact that she banned cutting of trees in the Uttrakhand and other regions of Himalayas for the next 15 years. The news of this movement was soon spread throughout the world and it inspired so other nations as well. The movement again took place in the year 2004 but this time, it could not achieve the success it got in the year 1973.